a. For large PDF files and low speed net connections, viewing PDF from a web server usually takes a lot of time and time-consuming. VeryPDF PDF Linearization Optimizer Command Line can regroup the elements of a PDF file, and make all the information for displaying the first page located at the beginning of the file. b. On a byte serving supported web server, optimized PDF displays the first page without transferring all the PDF pages to the browser. c. Several linearization modes: VeryPDF PDF Linearization Optimizer Command Line provides five different linearization modes, you can choose the most suit one to edit you PDF files. 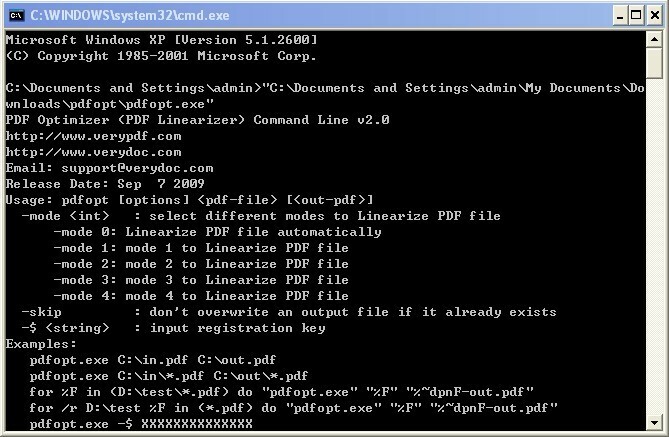 d. Free command line operation: VeryPDF PDF Linearization Optimizer Command Lineis for MS-DOS command line prompt interface use. With command line, you can freely control the input and output files with manual control or scripts. e. Development use: Under a Server License, you can run and call this application on your server. With a Developer License, you can code this application to implement the same function of it and redistribute with royalty-free. f. It does not need any third-party PDF editing software for optimization. 1. Support Microsoft Windows 2000/XP/2003/Vista/7/2008. 2. Optimize PDF files for fast web view. 3. Provide five different linearization modes (option "-mode"). 5. Support Development use: With a Developer License, you can code this application to implement the same function and redistribute with royalty-free. 6. Easy command line use, you can control the input and output files. 7. No need any third-party PDF editing software for optimization.